Archos has several mid-to-low range mobiles and the fear of them merging into one untidy mess clearly isn't a concern with the arrival of the 52 Platinum. With a price tag of just £129.99 (around $200, AU$250) the 52 Platinum certainly falls comfortably into the "affordable" bracket, finding itself mixing with the likes of the Moto G and Lumia 535. Front and centre is the 5.25-inch 720p HD display, which I found to be bright and colourful. Even at 5.25 inches text is suitably sharp and colours are bright. It is a little on the large size though, and those with smaller hands may find the 161g 52 Platinum a little unwieldy. The 8.8mm thick body is all plastic and a little reminiscent of the Nexus 4 in some of its design, but a metallic silver rim makes the 52 Platinum look a little classier. You'll find the power/lock key and volume rocker on the right side of the device, and as long as your hands are big enough they're easy to hit. Round the back the textured rubber cover provides a good level of grip, which is improved on the bottom third of the handset with the introduction of ripples. Even though the 52 Platinum may be on the larger size, it won't slip out your hand. You can also take the back off the handset, providing access to the microSIM and microSD slots as well as the 1750mAh battery. On screen you'll find the stock version of Android 4.4 KitKat, which will please Google fans out there, and operation is pretty smooth thanks to a 1.3GHz quad-core processor and 1GB of RAM. It's not the slickest interface I've played with and I noticed a few apps took a little while to load, but overall it's a perfectly acceptable system. The microSD slot I've already mentioned is likely to come into use if you pick up the 52 Platinum, as it only packs 8GB of internal storage and a chunk of that is taken up by the operating system. There's support for dual-SIMs too, but this functionality will only be available in select markets. Looking at the cameras on the 52 Platinum and round the back you'll find an 8MP snapper which is decent at this price point. It's a functional camera allowing you to grab the odd shot here and there, but it's not going to take eye popping snaps. Up front a 2MP camera is at your disposal for the occasional selfie fix or video call. 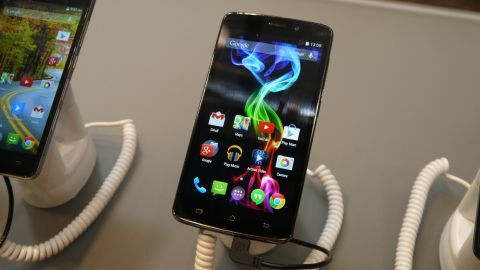 Like many of the handsets in the Archos range the 52 Platinum does the job you'd expect of a smartphone. It doesn't break any new ground, or have any fancy tricks to tempt you away from other brands, but it's unlikely to let you down if you do plump for it.